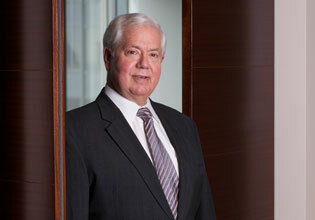 Ernest Irons began practicing law as a business litigator, but spent several years in corporate leadership before returning to litigation at Schuyler, Roche & Crisham. As his practice developed, he concentrated increasingly on restrictive covenant and trade secret litigation, employment discrimination and employee benefits litigation. Ernest acquired in-depth legal experience early, working at a highly successful private law firm where he advised and represented corporate and individual clients as lead counsel in business transactions and litigation involving employee benefits and employment law in state and federal courts throughout the country. He worked closely with client management regarding budgetary concerns and cost containment measures, and in developing legal strategies, corporate policy and procedures to eliminate or minimize loss. "RICO: Get Ready For The Onslaught" (The Brief, Fall 1986). "Environmental Law: What is "Major" in "Major Federal Action"" (485 Washington University Law Quarterly, 1975). J.D., Washington University, St. Louis, Missouri, 1976. Associate Editor, Washington University Law Quarterly, 1974 to 1975. B.A., Wabash College, Crawfordsville, Indiana, 1970. Illinois Super Lawyers, Law & Politics, 2005 and 2006.